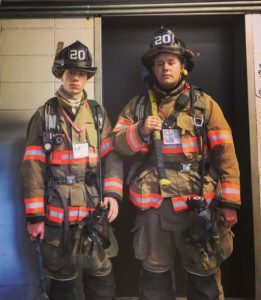 Today FF Tyler Anderson and FF Zach Karn climbed over 190 flights of steps in memory of our 343 brother firefighters and all others that lost their lives 16 years ago. It goes without saying that heroes never die and that we as an emergency services community will never forget. Rest easy brothers. FF Anderson climbed this year for Captain Terence S. Hatton. Captain Hatton served as the OIC with FDNY Rescue Company 1 during the attacks on the World Trade Center. FF Karn climbed this year for Firefighter Christopher Blackwell of FDNY Rescue Company 3.